It has become more convenient for people today to remember those important phases in their lives, thanks to technology. With most people owning smartphones, tablets and other portable devices, capturing any important memory in digital format is just one button away. Because of the convenience, it becomes automatic for many people to click away at just about any event worth remembering, be it at a birthday party, an accidental meeting with a celebrity, or even just ordering a memorable dish at a restaurant. How people are able to organize and store these digital memories is now something very important. There should be a convenient way to transfer and store them when device memory runs low. This is where the new Akitio Thunder3 Quad comes in. The Akitio Thunder3 Quad is a convenient storage solution for people who love to record and capture digital memories all the time on their portable devices. Since these devices come with limited memories, having the convenient means to transfer them for storage is becoming more and more important. 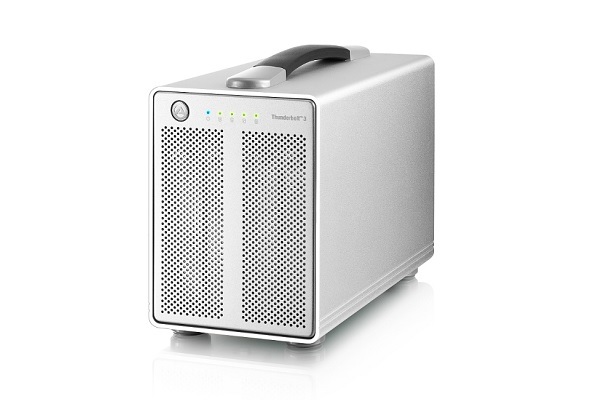 The Akitio Thunder3 Quad is a four-bay storage disk enclosure that comes with a fast Thunderbolt 3 standard connectivity in order to upgrade the speed of file transfers for today’s media libraries. It also comes with USB 3.1 as well as DisplayPort connectivity that allows for connection to today’s 4K 60 Hz displays. The Akitio Thunder3 Quad can accommodate either 2.5″ or 3.5″ HDD’s or SDD’s, which allows for up to 40TB of storage for people who hunger for storage memory and just cannot get enough of it. This special disk enclosure is expected to be available this month for around $430.